Home / blog-en / What is a thermal camera? 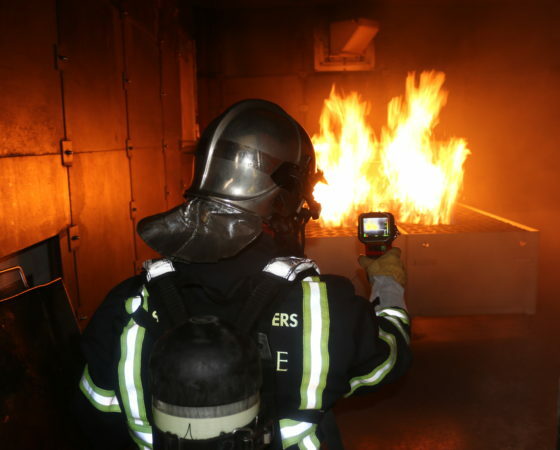 Today, many fire brigades have equipped their units with thermal cameras. They provide invaluable services in terms of fire detection, victim search or electrical circuit monitoring, for example. For the 125th National Fire Brigade Congress to be held from 26 to 29 September 2018 in Bourg en Bresse, we wanted to know more about the use of these devices and the difference between these observation systems and the night vision systems well known to military and civilian personnel and scientific observers of nocturnal animals. Although these two types of cameras operate on the same principle, that is to say, the recording of infrared radiation emitted by objects, they do not have the same scope of application. The infrared camera is sensitive to wavelength waves in the micrometer range (10-6 m) and is used to film night scenes that require additional lighting. As for the thermal camera, it detects waves that have wavelengths in the order of ten micrometers (10-5 m), called “heat waves” related to the temperature of the medium that produce them. The target is therefore the thermal emission showing, for example, a heat leak on a building or an electrical circuit, the presence of an individual in a secure perimeter, including at night and without additional light. The infrared camera, with its simpler design, will give less accurate results. Its cost will be lower than that of the thermal camera. The light spectrum is the set of light rays of different wavelengths forming a palette ranging from ultraviolet to infrared. The visible spectrum ranges from 380 nm to 800 nm. Below are UV rays (380- 10 nm) then X-rays (10 nm-01 nm) then gamma rays (<0.1 nm). Above it are the infrared rays (800 nm-1 mm) then the radio waves (> 1 mm). By the definition, “A technique for obtaining, by means of appropriate equipment, the thermal image of a scene observed in an infrared spectral range”. By extension, a measurement technique that makes it possible to know the spatial and temporal distribution of temperatures on an object. Any method of heat measurement and quantification. Infrared: electromagnetic wave with a lower frequency than red light (500-780 nm). A distinction is made between near infrared (0.78 µm (780 nm) to 1.4 µm, medium infrared (1.4 to 3 µm), far infrared (3 to 1,000 µm). The temperature is measured without contact. Any object whose temperature is above absolute zero emits natural radiation proportional to its temperature, part of which is emitted in the infrared. This radiation is picked up by a detector element through a lens or optic and converted into an electrical signal proportional to the radiation. This signal is amplified and digitally processed for display. Without going into detail, an important parameter varies according to the constituent material of the target object: emissivity. It corresponds to the ability of the object to emit radiation. An incident flow can be reflected, transmitted or absorbed and then re-emitted. This means that the same temperature will be measured differently depending on the nature of the substrate. For example, the glass and polished metal parts reflect the thermal image like a mirror, which can lead the observer to believe that the substrate emits IR when he is only reflecting them! The separating atmosphere, depending on the distance from the target and the ambient humidity, can also influence the result. Automatic compensation must therefore be applied by the device. Thermal cameras generally have only one channel, so the image depends only on the intensity of the radiation. The colours obtained depend on the intensity received. Each colour has its own intensity, which makes it easier to read directly on the screen. There are several types of sensors, formerly reserved for the military world. The FPA (Focal Plan Array) detector is a matrix composed of multiple sensors. It is located in the focal plane of the camera and simultaneously measures the radiation from all points of the image. When the matrix is made of amorphous silicon, its electrical resistance varies with temperature: when radiation hits the material it heats it up and modifies its electrical resistance. This change in resistance, called the bolometer effect, in a pixelated system is used to create a thermal image. To simplify, each pixel acts as a thermometer and collects several thousand temperature information for an image. This type of sensor is called a microbolometer. The photographic sensor modified to detect IR rays. They are themselves dazzled by their own infrared emission and require cooling by cryogenic techniques (-196°C with liquid nitrogen), unlike less accurate but much easier to handle microbolometers. To summarize, an objective lens concentrates infrared light, this light is scanned by infrared detectors that determine the temperature of the areas according to the wavelength of the infrared, the thermal image is then converted into an electrical pulse creating an image on the screen. The image is presented with an artificial color, red for the warm parts and blue-black for the cold areas. While the thermal imaging we have just seen is an excellent technique for seeing heat-emitting objects, there is another night vision technology that is based on the intensification of very weak light. The night vision scope collects the extremely small ambient light belonging to visible light and the lower part of the infrared rays that is reflected by objects (moonlight, starlight or weak sources). The device amplifies this light up to 5,000 times to give a visible image on a screen. Thermal infrared rays are emitted by the object while medium and near infrared rays are reflected by the object. An objective lens concentrates the light. Photons (light) are converted into electrons (electricity). By passing through the amplifier tube the electrons are multiplied several thousand times. At the end of the amplifier tube, the electrons hit a phosphor screen by reproducing the original image with a characteristic green color. This camera does not work when there is no light (cave, building interior…). Infrared lamps can then be used, whose beam is invisible but whose rays reflected by the object are amplified and analyzed by the night vision camera. Thermal and infrared cameras are defined by their spatial resolution (the smallest visible object) and thermal resolution (the smallest perceptible temperature difference). Moreover, these 2 resolutions are linked. There are many applications for thermal cameras. in particularly in the building they are used to detect weak points in the isolation of a building, to check hot pipes (underfloor heating for example), to check connections in an electrical cabinet…. In the military and police fields for night operations or progression in confined and/or smoky environments…. For fire brigades, there are many applications such as searching for victims in large volumes such as underground car parks, factories, etc., searching for fireplaces or smouldering fires, electric fires, searching for victims ejected during road accidents, locating victims in premises that are difficult to access, locating liquid or gas leaks, monitoring overheated electrical circuits, etc. Ouvry SAS supplies Argus Mi-TIC thermal imaging cameras (4 different models with different characteristics: the measured temperatures can range from -4°C to 1,100°C). 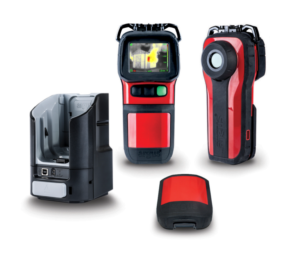 These cameras have just been certified NFPA 1801:2018 = Standard for Thermal Cameras for Fire Services” which defines the minimum performance requirements for thermal cameras. They are primarily intended for firefighters. This entry was posted in blog-en and tagged Detection, Industry, News. Bookmark the permalink. Anthrax back in France: Should we be worried about it in the CBRN context?